What a thoughtful gift for Mum. This coaster makes a great addition to Mum's home decor and if made flat and varnished, can be used as a functional coaster! Apply Art Potch to the terracotta tiles using the adhesive brushes for an even coverage. Adhere the torn pieces of Kraft Foil Paper, pressing securely. Stick on hearts or any other icons cut from Glitter Paper. Once finished, coat the entire tile with Art Potch to seal it. Your coaster is ready to use! 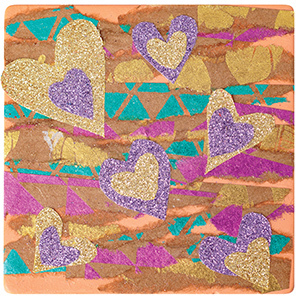 Paint or draw on the coaster in conjuction with the patterned paper, or use washi tape to add another decorative dimension.